Today I am super excited to tell you about Jacqueline's fantastic new challenge site. Plus I am super, super excited to tell you that I am on the design team for this challenge-my very first DT!! I feel very privileged to join this team of very talented Ladies. 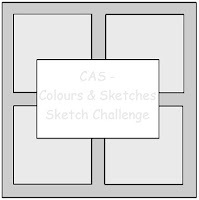 The challenge site is CAS-Colour and Sketches. Yep, that's right, you get to play along some weeks with colour combos, some with sketches and then we have 'The Double' where we have both a colour combo and a sketch! Your challenge is to make a card using the sketch and colours as your inspirations. Only cards for this challenge and keep as close as possible to the colours. There are a few other rules that you can view here on the blog. BUT the main thing is to have fun! Now, I know these colours scream Autumn but I decided to go Christmas for a change. I didn't have 'cherry cobbler' ink so went for a colour as close as possible. I flipped the sketch and took very CAS interpretation of it using these little PTI border stamps to represent the squares. The verse is a Verve stamp. All the card stock has been embossed using my, much loved, PTI linen impression plate. A few little gems to match the 'pumpkin' sentiment stamp and there you go! Now pop on over to the other DT members site Jacqueline, Louise, Kylie, we would love to know what you think of our cards and this new challenge site. Congratulations, my friend!!!! A well-deserved honour. And this card only proves it. It's definitely CAS and undeniably YOU! Stunning! Am going to swing by the blog and have a good ol' snoop! Woohoo! Big huge congrats on a very well deserved recognition! And you rocked the sketch and color combination! I love how you made the sketch a bit simpler and the flourishes and sentiment are perfection! Congrats on your new DT gig Sandie! Elegant card, love the flourishes! AWESOME news, Sandie! I am SO happy for you! Love the challenge concept and you are absolutely perfect for it! I hope to participate some time!! CONGRATS! !